Have you ever met someone that you were totally amazed by and that really, properly, inspired you? That was us last week. Lives in Hackney. Graduated from Cambridge. Works at Grey London as a Planner. And he has Cerebral Palsy. Mike is a force to be reckoned with. And we are so lucky he was chosen to represent Grey London for TIE this year. 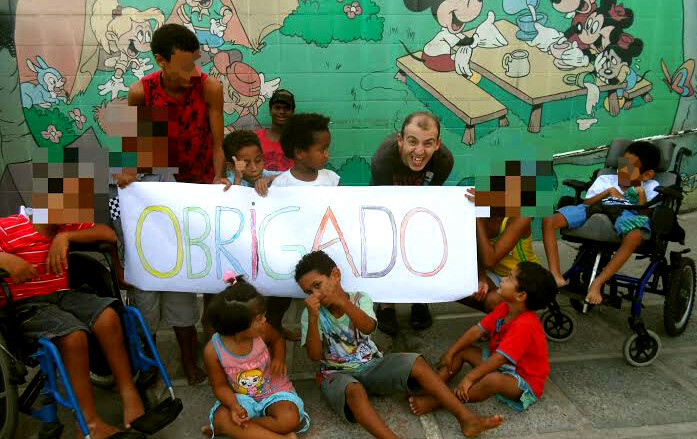 He arrived in Brazil last week, and is working with an organisation that supports children with disabilities who have been victims of domestic violence, or have been abandoned. I feel so honoured to be able to share a bit of Mike’s story. See what he has to say about his experience, why he chose to support the organisation, the crazy (!) things he did to raise money for his campaign and about life over all. I know you will enjoy this read. TIE: Mike, can you tell us a little bit about yourself? MIKE: Born and bred in Hackney, I consider myself one of the ‘originals’. After graduating in history at Cambridge, I decided that the world of communications was the best course of action after studying Martin Luther et al. I was fortunate enough to find myself at Grey London where I first interned and then secured a job in the planning department. The thing I like most about planning is its focus on the consumer and understanding the motivation behind purchases. As planners, we really enjoy getting under the skin of consumers! I work on a wide range of brands, spending my time across Lucozade Sport, Fairy and Scope. It means I get to see the difference between commercial and non-commercial operations. Outside of advertising, I’m a football die-hard with a devotion to Manchester United so it’s very lucky I’ve come to the spiritual home of football! TIE: This is the first year that Grey London is getting on board with TIE – and they did a huge campaign within the agency to find the person to represent the agency for their first TIE placement. Why did you apply? MIKE: I applied to TIE because I believe it is always important to test yourself and try new experiences. I know this is often repeated, but it’s rare to have the chance to take your skills at work and use them in a completely different environment and setting. I wanted to see what it was like to work in a different country with new people and on a project that has a unique social outcome. I also applied to TIE because it represents a wonderful hybrid, bringing together the two separate worlds of commercial companies and social enterprise. So often considered distinct, I want to see if the two worlds can learn from each other and if they can work together towards shared goals. TIE: The connection between you and the NGO you chose to work with is such a beautiful one. Can you explain why you chose to work with Lar Regane Marques? MIKE: As someone with cerebral palsy in the UK, I consider myself very fortunate to have had the opportunities I’ve had in life, education and work. Consequently, I wanted to understand what disability might be like in a different part of the world. In particular, I wanted to find out what worked well and what worked less well. TIE: We noticed that the faces in some of the pictures you sent us are blurred. Why is that? This is because the children have been taken into care (often due to parent’s alcohol/substance abuse) and their children’s whereabouts are unknown to them. It is therefore important to protect their identities. Every photo has to be checked before being released and must not feature any full on profiles. TIE: People go on TIE for many reasons. Can you tell us what you hope to get out of this experience? Mike: I chose to take up the TIE challenge because I wanted to gain a fresh perspective, both on the advertising industry and life in general. Working in London’s adland is an amazing experience but it can be quite a self-contained environment so it’s always important to freshen your thinking and see how advertising operates in different parts of the world. In particular, what they do differently and what we can do differently. Secondly, I love experiencing different cultures. As someone who had never been to Brazil or South America before, TIE represented a fantastic opportunity to found out why everyone is talking about Brazil as an upcoming power in the 21st century. TIE: There is a bit of a preparation period for everyone before they go on TIE – one of which is to fundraise their marketing budget. Tell us a little bit about how you prepared for your arrival – like jumping out of a plane?! What was that all about? MIKE: Each TIE project requires you to fundraise a marketing budget as the NGO often has limited funds available. Consequently, I found myself jumping out of a plane. Yes, that’s right! I’ll be honest enough to admit fundraising isn’t my strong point and had left it rather late as my instructor soon found out. Just before the jump, my instructor asked me how long I had wanted to do a skydive and I replied: ‘about a week’. I was lucky enough to fit in a last minute jump and discovered the powerful impact of doing such a stunt. Alongside, the jump I also sold Brazil nuts posing as ‘My Nuts’ which provided a quick visual gag and meant I was able to give something back to people. It turned out to be a bit of a whirlwind as in little over a week I was able to raise roughly £2000. I’m hugely grateful to everyone that helped make this happen and for those that supported the cause. Thank you!! TIE: We’d love to know what your first impressions are of Brazil, where you’re based and your overall experience so far. MIKE: Massa! In case you don’t know, that’s Portuguese for fantastic. From having a typical Brazilian Sunday lunch of feijoada in Rio to getting to know my project in Recife, it has been brilliant. The people have been so friendly and welcoming and there’s so much going on. This does and will probably sound stupid but Brazil is a vast country. Just travelling from Rio to Recife by plane took two and half hours and they feel like two completely different places. Indeed, you could fit the entire continent of Europe inside the country. It’s interesting how come from London you have to alter your mindset about the way a country works. TIE: As someone who has cerebral palsy, yet still pushes himself to do everything (if not more) than an able person does, what message can you give to others who may have potentially limiting disabilities? MIKE: It is very easy to think about what you can and can’t do. I often think it’s better to be pragmatic and make you grab the opportunities that come your way whatever they may be. Just like anybody else, it is important to recognise the good opportunities and make sure you take advantage of them. It is important to recognise that there is still a lot you can do, it just might take a bit of lateral thinking to get you there.